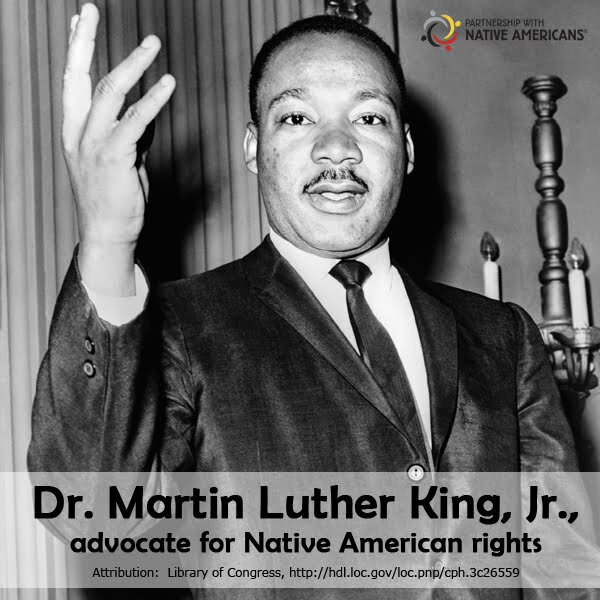 In recognition of Martin Luther King Jr. Day coming up on Jan. 21, we remember a man who not only fought for the civil rights of African Americans but also advocated for social equality of Native Americans. Dr. King spent his life in pursuit of his goal that one day we may be judged not on the color of our skin but on the content of our character – and he championed equality for all people of color. Dr. King’s actions aided Native Americans more than most of us know. He specifically advocated for the desegregation of Native Americans and inspired much of the modern-day advocacy for Native rights, including water rights and tribal sovereignty. Many advocacy groups for tribes, such as the Native American Rights Fund, arose shortly after the era of Dr. King in the wake of the Civil Rights Movement. Dr. King’s words inspired a deeper focus on how the history of oppression has affected all “people of color” in America and his legacy lives on in those who continue to seek equality. This Martin Luther King Jr. Day, we encourage you to reflect on Dr. King’s work and what it means for us today. Celebrate his legacy through an act of kindness, a volunteer effort, or learning more about the rich history of his accomplishments and the movement that sparked so many of today’s American ideals. 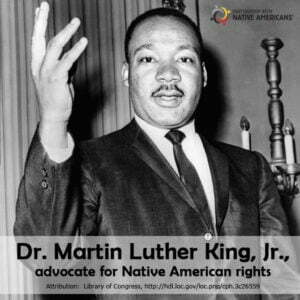 This entry was posted in Humanitarian and tagged civil rights, Martin Luther King Jr., MLK Day, Native American rights, social equity. Bookmark the permalink. Trackbacks are closed, but you can post a comment.